As a small business owner, you may have thought that you need high-performing website to be competitive in your industry. However, a strong digital presence is no longer optional for business, it is a must. Is it worth investing in or upgrading an outdated website? Google is the King information portal globally. After all, we refer to all forms of internet search as “Googling”. With almost half (3.4 billion) of the world’s 7.4 billion people online, and 84% of the US population online, a small business website quite literally is a business owner's gateway to the world market. All of those people on the internet results in 3.5 billions searches on Google per day. What this means is that each person Googles something, on average, every other day of the month. In other words, there are tons of opportunities for your products and services to be found online by anyone in the world seeking what you’re offering. The key to capitalizing on those searches is a professional, mobile responsive website that is optimized for SEO. With the advent and wide adaptation of smartphones, it should come as no surprise that almost 81% of mobile searches through October 2018 were done on Google. As a matter of fact, mobile searches have eclipsed computer-based searches in 10 countries worldwide, including the United States. While many business owners may view websites as a computer-only portal to their customers, data shows that a mobile-optimized website is a relevant and necessary part of online marketing. A well-designed, modern, responsive mobile site will appease your customers and these four things can get you started to perfect web design. Simply expecting your website to generate sales, leads, or orders will leave you (and your customers) feeling a little empty. One of the major advantages to a website is the potential to catalog your entire business’s expertise in one place. You’re an expert in your trade, so show your expertise through content. A website allows you and your employees to essentially warehouse your expertise and knowledge in the form of blog posts. You may say to yourself, “yeah, but aren’t blogs for… bloggers?” No, their purpose is to educate potential customers and continue to educate current customers all while indexing colossal amounts of “Googleable” information. All of this by writing about what you are already an expert about! As we’ve already mentioned, the global adoption and access to internet worldwide makes your website a true global gateway to your business--a digital business card of sorts. A website is already one of the major keys to success in digital marketing and with the right design, your website will be a global portal for your business and prospective clients. For your website to be a successful sales tool and something that can appeal to a wide audience, simplicity and functionality are key. If you're making your website from scratch there are a few points you should keep in mind. 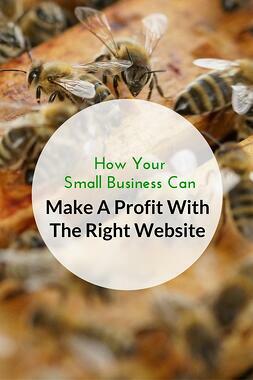 Building A Small Business Website? Here's What You Need To Know. Visitors to your site should be able to easily navigate to find the information they are seeking. Through thoughtful design, modern aesthetics, and a high degree of functionality, your website can help drive traffic, generate more leads, and create opportunities for more sales through a larger pool of potential clients. Just because your business is considered a "small business", you shouldn't discredit it by shorting it an opportunity to succeed in big ways. As a business owner, you most likely study the successes of some of the titans of business and look to the leaders in your industry as the loose blueprint for what you do and how you operate your business. With that said, look to those same leaders in your industry to get ideas for how to start and design your website. The best in the business are the best for a reason, and their expertise can become your building blocks for an excellent website full of your own content. The beauty of your own site is the freedom for design and function to fit your buyer personas. Bottom line: use your website to showcase who you are while opening more opportunities for leads, sales, and future customer engagement. Editor's Note: Originally published in 2016, this post has been edited and updated in November, 2018.